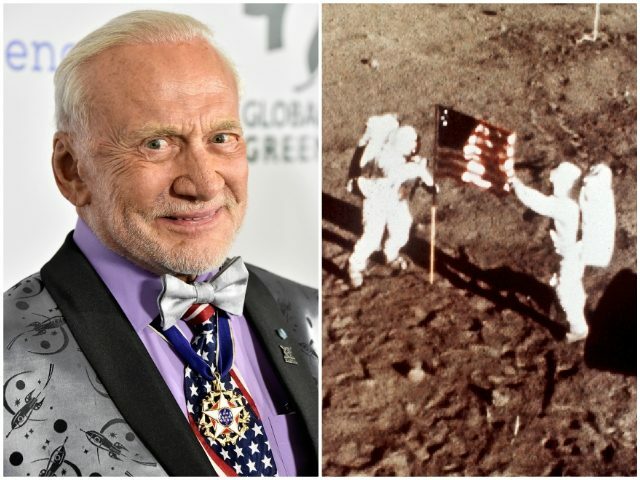 On Saturday, the Aldrin tweeted four photos of himself donning a t-shirt, which reads “Buzz Aldrin, Future Martian,” with an astronaut planting the American flag into a planet. In addition, the iconic astronaut retweeted user @pir8lksat40’s photo of him saluting with a photo of the moon landing behind him. Aldrin also retweeted a photo of himself saluting while standing next to an enlarged photo from the Apollo 11 mission that includes the flag on the moon. In an interview with The Telegraph, First Man star Ryan Gosling said the decision to exclude the planting of the American Flag was driven by the notion that the moon landing was regarded as a “human achievement,” rather than an American one. “I think this was widely regarded in the end as a human achievement [and] that’s how we chose to view it,” the actor, who plays Armstrong, told the British newspaper. “I also think Neil was extremely humble, as were many of these astronauts, and time and time again he deferred the focus from himself to the 400,000 people who made the mission possible,” the actor told the British newspaper. First Man is scheduled to hit theaters on October 12, 2018.